Starting with v6.0.163 of Email Address Collector, you can filter and extract email addresses from Windows Live Mail folders & email messages. If you already use Email Address Collector, you can download the update by using the “Check for Updates” function available on the Email Address Collector toolbar menu. Or you can download the latest setup file from here. Once you selected Windows Live Mail, the program will display your email folders on the left column. 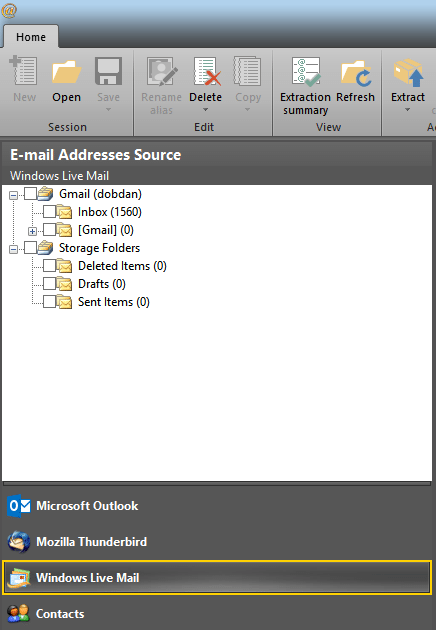 You can then choose the email folders from which to extract email addresses.